Exhibitions showing the latest in robot and automation developments are popular around the world, and attract public as well as industrial user interest, so there is always a big audience. In Europe, and particularly in France, the major exhibition and conference is InnoRobo, typically attracting around 15,000 visitors every March to Lyon, the second largest city in France, and capital of the south central Rhône-Alpes region. Founded four years ago, InnoRobo was initially dedicated to service robotics, rather than automated production machines. 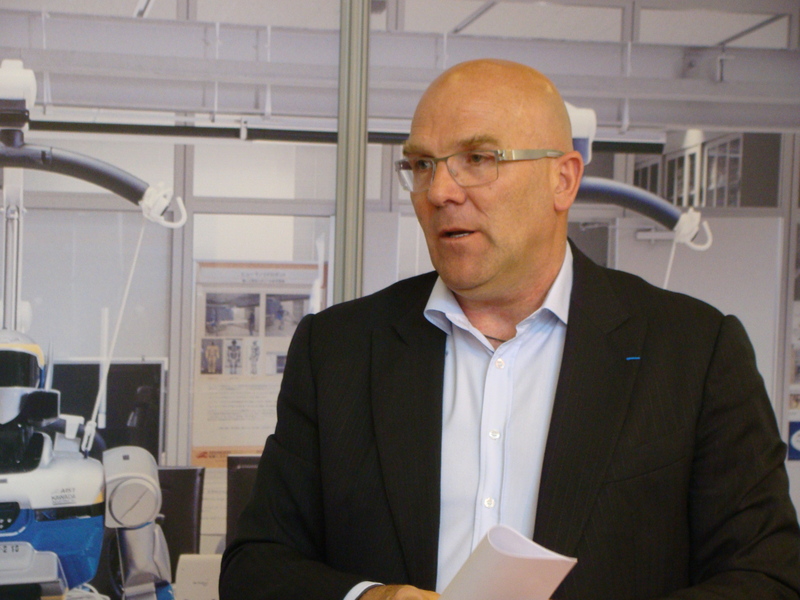 Bruno Bonnell, president of Syrobo, the French association for robotics companies, commented that four years ago the show had prototypes only, with no ‘live’ machines available from production. Last year the synergy between service robots and industrial robotics was the main discussion point, and ‘cobotics’ had emerged – the science of human-robotic collaboration. At the 2014 show, from 18-20 March, the scene was totally reversed, with every stand demonstrating working production models, and the prime discussion point was human-machine collaboration. Most robots displayed smooth moulded contours, with custom plastic mouldings to cover joints and motors, presumably formed from 3D printed moulds, since the maximum production runs discussed were around 1000. 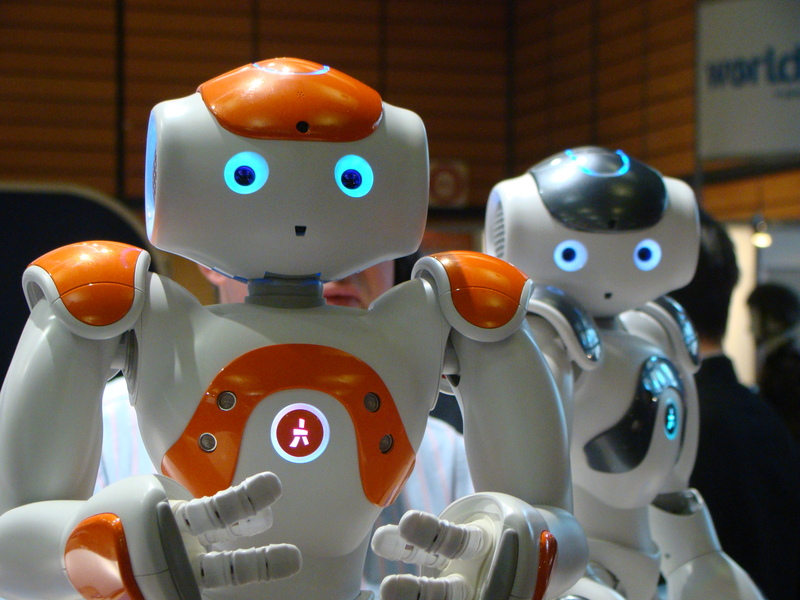 The smaller humanoid robots developed first, like the Nao, have grown bigger with second generation units getting taller, and even some full sized – in height: some were more expensive than others. Business investment, start-ups and opportunities were at the front of everyone’s mind. InnoRobo last year launched a call for start-up companies to present their ideas to a jury of high tech investors, and obtain a slot at the conference to pitch to a wider audience. This was repeated in 2014, and there seemed to be a wide range of Government, Regional, entrepreneurial and Stock market funds available to the right ideas. Undoubtedly a lot of this finance is being channelled into research projects, typically at Universities, but many times this work is undertaken in health or medical departments, or others, like agriculture, where robot software engineers are becoming more acceptable as staff members. Plus the producers of the robots, like the Nao from Aldebaran in France, or the ICub robot from IIT in Italy, find these University studies provide the major market for many hundreds of production robots. Typically these researchers can pool the available software developed in many centres, to enable their next research step. Within the French National Institute of Health and Medical research, the robot software development team has been working since 2008, and has now seven people working on human-robot interaction. They won the funding to acquire the ICub robot based on this work proposal, and have developed eye and eyelid movements to give the right social signals. Other groups co-operating on similar tasks (across Spain, Italy, Britain, Scandinavia and Switzerland) have been developing such aspects as mouth and lip movement, with the same objective, and the ICub variants developed have had success in interfacing with children with learning difficulties. As ever, to get on in this world, you need to brush up on your interpersonal skills, and this is needed for robots too. The potential for the robotics industry makes it a prime target for development investment by Governments, as a classic high tech industry creating many high-tech jobs. Obvious in Lyon were the efforts from the French and German Regional Governments, and from the European Commission. Regional clusters of expertise, maybe in different aspects of the technology, were claimed for Rhône-Alpes, Aquitaine, Midi-Pyrénées, and Bavaria/Munich. Eric Bourguignon of Bayfor Munich claimed to be project managing many EU funded robot projects, with international collaborations, and even providing travel grants for local industry to visit international partners. In France there has been specific robotic expertise developed by the nuclear industry, for example by CEA in the south, which is also applied by Areva in their nuclear plants. Philippe Bidaud of GdR-Robotique, the French co-ordinating body for robotics research in Government institutions, also mentioned the use by CNRS, the French Railways, of drones, on civil engineering survey work, for example monitoring lines across bridges and other structures from the air. Flying at 150m, these drones can monitor rail line positioning to within 2mm. Frank Tobe, based in California, is the publisher of the website www.therobotreport.com, which identifies and provides data on all companies working in the robotics market. Tobe is also the co-founder and research analyst for Robo-Stox LLC, the first benchmark index to track the global robotics and automation market, which has the aim of providing investment products that target these sectors. He arrived at InnoRobo in Lyon straight from Modex, a material handling exhibition in Atlanta, where he had been impressed by the warehousing systems developed by Amazon following their acquisition of Kiva Technologies in April 2012. From his website the distribution of current robot commercial companies can be assessed, which actually shows how these are mainly concentrated in Southern Germany within the European area, perhaps in contrast to the R&D activities presented throughout the conference from France. Tobe sees agriculture as the area where aspects of robotic technology will give the major benefits initially, but points to companies like Apple, Amazon and Google who are investing heavily into the technologies. Vision systems and software are the major investment areas, followed by production engineering. Examples quoted by Frank Tobe perhaps illustrate how the discrete automation systems are being changed to process automation systems using “cobotics”: there is now an automated pizza machine that will produce a hot pizza with a customer specified topping in 5 minutes, and a similar hamburger machine – and he praised Fanuc for having the first “dark” factory, totally unmanned, producing components from fully automated machinery. Fanuc attended the InnoRobo conference, and claimed 15000 robots active in France, from 15 separate integration partners. Bruno Bonnell, of Syrobo, is also a partner in Robolution Capital, a Paris based private equity fund (managed by Orkos Capital SAS) that will invest in innovative companies in the ‘fast growing’ service robotics market, mainly within Europe. The management of the fund sees potential in many European companies, and is not limited or restricted to France – although many of the team of the fund managers are French. The comments in the fund launch presentation, translated from the French, commented that “Today, 60 French laboratories are recognized worldwide for their service robotics, and Robolution Capital can create leverage to make France the California of Europe”. The required funding target of Euro80m was achieved in March, with a 50/50 public private split: the public money coming from Bank Bpi in France, insurer AG2R-La Mondiale, Orange, EdF and Thales. The first investments, of between Euro300k and Euro5m, are expected to be made by the Summer of 2014. The Robo-Stox portfolio by value is 36% made up of US companies, and 24% from Japan: 6.4% come from each of Germany and Taiwan, 5.1% Switzerland and 3.9% from the UK: France has 2.6% along with Sweden, Israel, Netherlands and Canada. Of the companies allocated 2.35% of the weight of the portfolio each, the industrial automation names are ABB, Fanuc, Keyence, Kuka, Omron, Rockwell, and Yaskawa. Other companies that are allocated just under 1% each include Brooks, Flir, Jenoptik, Mitsubishi, NI, Renishaw, Schneider, Siemens and Yokogawa. An evening reception held in the sumptuous ballroom of the Lyon Town Hall, included the presentation by the InnoRobo organizers of the Čapek Prize to Prof Hirochika Inoue of the University of Tokyo, in recognition of his work on the development of robot-human collaboration. As Prof Inoue commented, a collaborative robot possibly becomes corroborative to a Japanese speaker, so the end result has been simplified to the word “Cobot”, for a co-operative, service robot. While this signals a move of the image of the robot away from that of the classic aggressive machine with sharp humanoid features, the silver statue presented in recognition of the prize for Prof Inoue’s work showed a return to the old image of a warrior robot – the education needs to continue! As might have been expected, the show aisles were quite crowded with various different styles of robot, some walking, some automated delivery systems, alongside the visitors. From France, AWAbot.com telepresence technology (created by Bruno Bonnell in 2011) was in evidence with Beam robots strolling around. 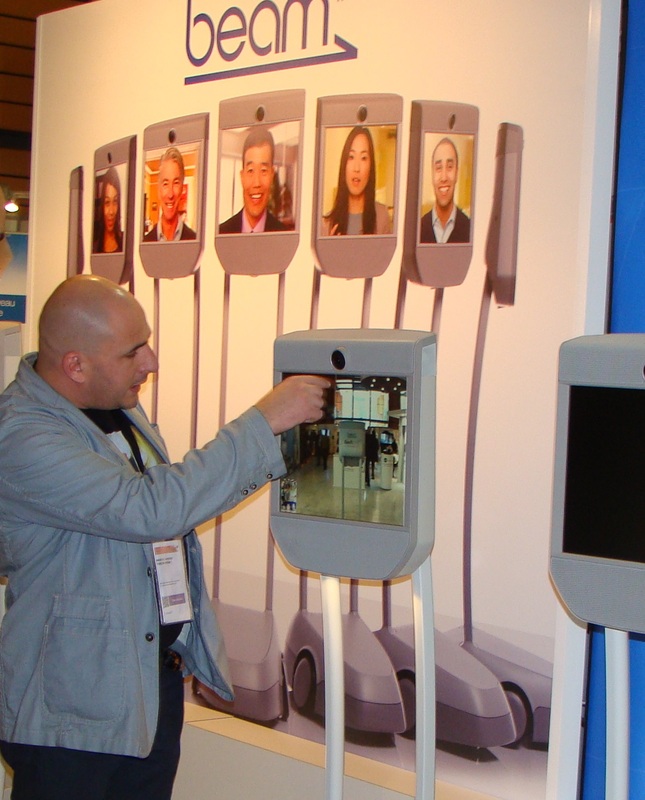 A user of such a telepresence robot guides a wheeled robot remotely, via the internet, and communicates with the remote environment by internet quality speech: the picture of the remote person, from his webcam, is shown on the screen held at eye level, and can be seen by people in front of the robot. While the person driving the robot can see in front of him, inevitably people to the side and behind are in danger of being knocked around, which caused some broken glasses from drinks tables at one evening reception, gate-crashed by the robots! Actually, these robots did seem to spend most of their time talking to one another, maybe because everyone else avoided their attention. Maybe the design needs more attention in the interpersonal skills area, which is what ‘cobotics’ is all about! Have you managed to solve how to do it yet? At the “Big Bang” Fair in Birmingham, UK, an automated system based on a Samsung Galaxy S4 Smartphone analyzed the cube and instructed four robotic hands to do the manipulations. These were controlled by eight Lego Mindstorm EV3 bricks – all these intelligent devices are equipped with ARM processors, and they completed the task in a record 3.25 seconds. The “robot” system was created by Mike Dobson and David Gilday, who seem to be specialists in the Rubik cube. The Big Bang Fair is designed to encourage UK school children to take up science, technology, engineering or maths careers.